Home > Safety Signs > Hazard Warning Signs > Machine Hazard Signs > Caution Crush hazard symbol and text safety sign. Caution Crush hazard symbol and text safety sign. Caution hot surface symbol and text safety sign. 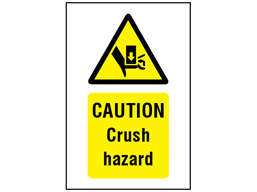 Crush hazard symbol safety sign. Danger Arc welding symbol and text safety sign. Foot protection must be worn in this area symbol and text safety sign. Gloves must be worn symbol and text safety sign. Caution Crush hazard symbol and text sign. Part of our hazard warning safety sign range, to create awareness of workplace injury risks from crush when two objects move towards each other, or when one object moves towards a stationary one. This can include rolling, sliding, shifting or unbalanced industrial, construction and agricultural machinery causing squash injuries to limbs or to bodies, ranging from minor bruising to severe crushing and compression. Warning safety signs. Caution Crush hazard. General hazard safety sign, comply with BS 5378, Safety Signs and Signals Regulations 1996, and the Provision and Use of Work Equipment Regulations 1998. WS4410 Size 150mm x 100mm. Material self adhesive vinyl. WS4411 Size 150mm x 100mm. Material rigid plastic. WS4412 Size 300mm x 200mm. Material self adhesive vinyl. WS4413 Size 300mm x 200mm. Material rigid plastic.